Matthew 7:1 is arguably one of the most abused Bible passages in the entire history of Christianity. If you don’t know that reference, the text itself is likely familiar to you: “Judge not, that you be not judged” (ESV). In our society today, you are very likely to hear that verse quoted at you if you try to tell someone they are doing something wrong or that they are believing something wrong. But is that how Jesus meant His words to be used? Hardly. I say that for two reasons. Clearly the Lord was teaching against hypocrisy. That is indisputable since He clearly refers to criticizing others for little faults (“the speck that is in your brother’s eye”) while failing to see one’s own major faults (“the log that is in your own eye”). 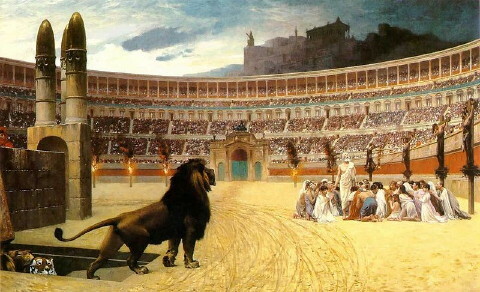 It is also indisputable that He is speaking against hypocrisy because He plainly says, “You hypocrite, … ” His final admonition in v. 5 should put to rest the kind of abuse of this passage I described earlier, where Christ said, “[F]irst take the log out of your own eye, and then you will see clearly to take the speck out of your brother’s eye.” Obviously the Lord was not prohibiting all criticism but specifically the hypocritical kind whereby one delights in finding fault with others without concern about changing oneself first. I heard someone once say, “A text taken out of context becomes a pretext for a proof-text.” How true. 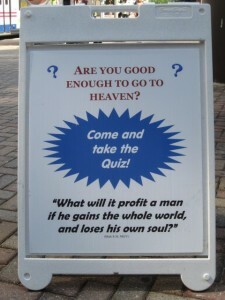 Recently I was doing some street evangelism with my A-frame sign, which asks the poignant question, “Are You Good Enough to Go to Heaven?” A woman approached and adamantly quoted Matthew 7:1 to support her belief that people of all faiths are going to heaven. Her basic argument seemed to be that we should not tell people they are not going to heaven because that would be judging them. Aside from the fact that I don’t actually tell people they are not going to heaven but instead ask them to take a quiz so they can determine that for themselves, she was clearly misusing Matthew 7:1. Now it shouldn’t—and didn’t—surprise me that this verse was misapplied. It happens often nowadays. What amazed me, though, was that the woman who said this was a professing Christian. Before she went into her message of religious pluralism, she declared confidently that she had accepted Jesus as her Lord and Savior and that she prays every day. Let me say it again: This amazed me. Why? Because it was a blatant denial of the value of Christ’s blood coming from someone who claimed to follow Him! Jesus’ sacrifice on the cross is pointless if people who don’t believe in Him will get into heaven anyway. The truth is that the One who said “Judge not” also said, “I am the way, and the truth, and the life. No one comes to the Father except through me” (John 14:6, ESV).